Image Overlay places an image (taken with the Image Capture function or manually placed from a computer onto the SD card) directly on top of your footage - very useful for judging shot continuity, particularly when using the built-in 'blink' feature. 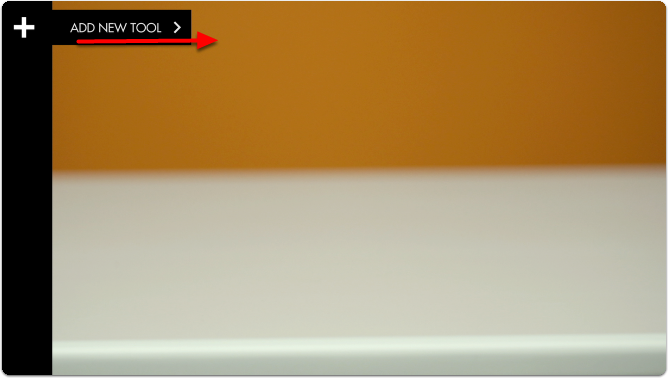 In this section we will add an Image Overlay to a page to help us shot-match. Having already used the Image Capture function to take a snapshot of our scene, we can now use Image Overlay to display that snapshot back on top of our footage. 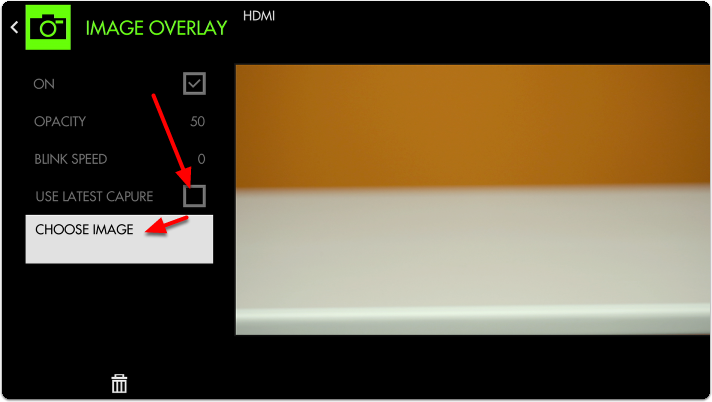 Navigate to Overlay > Image Overlay and click on the '+' to add it to the current page. 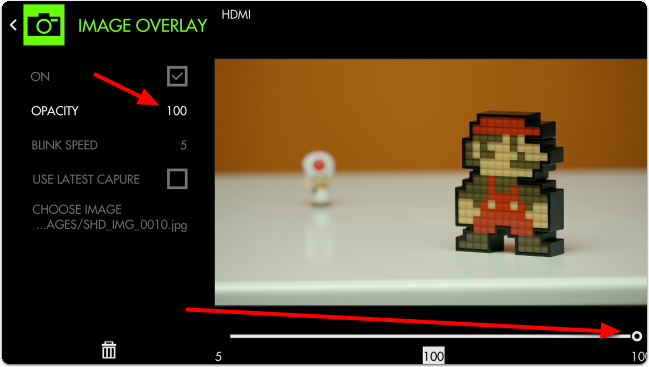 By default Image Overlay displays the latest snapshot taken with Image Capture at 50% opacity. 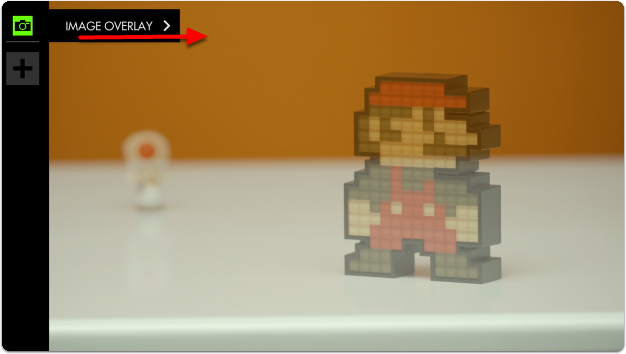 You can edit the settings by navigating right with a joystick or tapping the right arrow on a touchscreen when ‘Image Overlay’ is highlighted. If we then dial up BLINK SPEED the monitor will flash alternately between the live feed and the Image Capture, offering a very clear view of how to fix the shot. With Image Overlay blinking, we now have a straightforward means of matching the original placement of characters on screen! 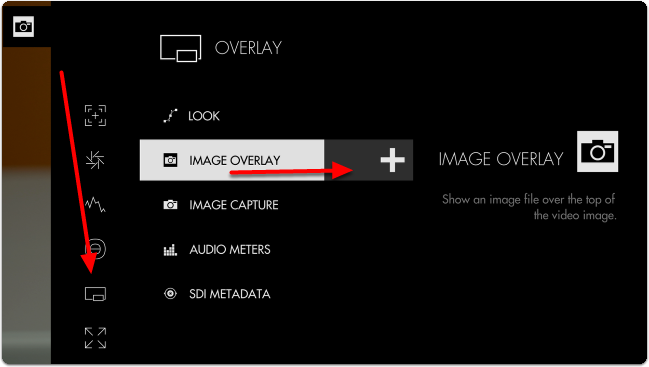 Access Image Overlay tool settings menu by navigating right or pressing the right arrow when Image Overlay is highlighted in the tool list. Toggles display of the currently selected Image Capture. Set the transparency/opacity of the Image Overlay. Blinks the overlaid image at a speed of your choosing. Leaving this at zero disables the Blink functionality. 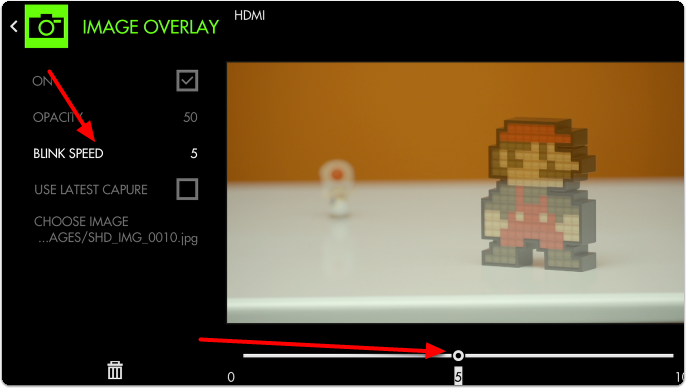 Displays the latest Image Capture automatically, even as a new one is taken.